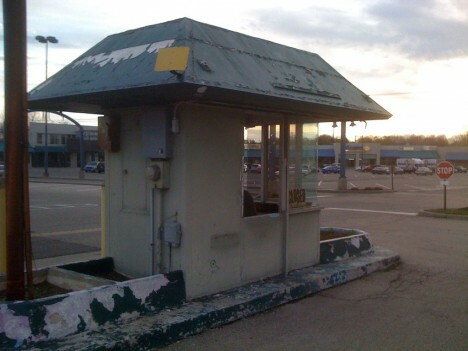 Rendered obsolete by technology, hundreds of abandoned Fotomat drive-thru photo development kiosks still stand in suburban shopping center parking lots. 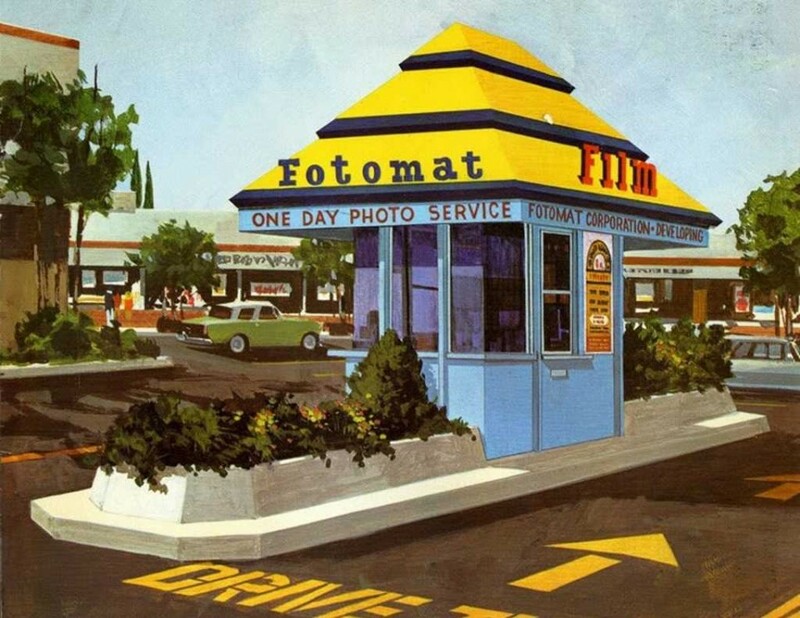 Founded in the mid-1960s, Fotomat specialized in drive-thru, “One Day Photo Service”… that’s right kids, people once had to wait until the next day to see photos (presumably of dinosaurs) they took with their clunky analog cameras. 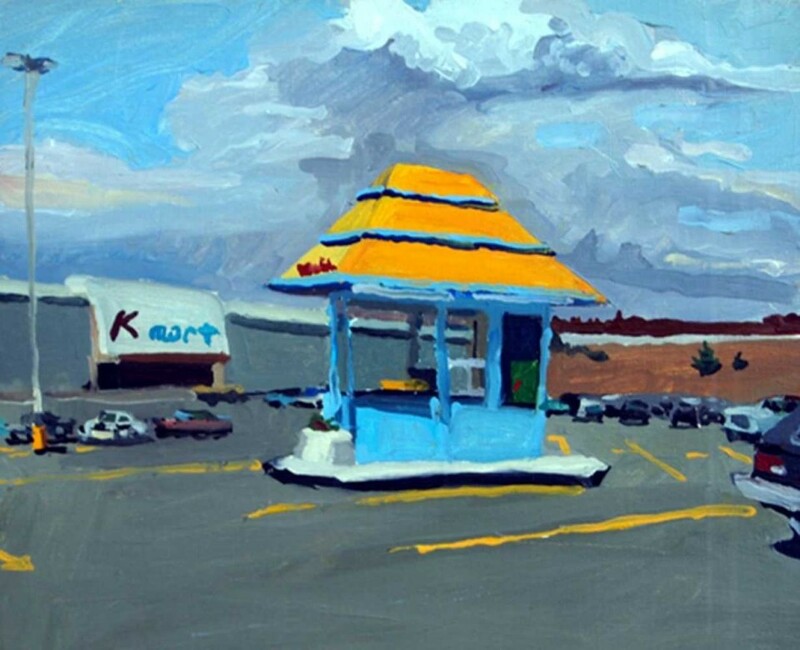 By 1980, over four thousand yellow & blue, pyramid-roofed Fotomat kiosks were scattered across suburban parking lots from coast to coast. Built to last on cast-concrete berms, hundreds of abandoned and re-purposed Fotomat kiosks still stand, reminding us of better days and good times cast in Kodachrome. Fotomat Corporation sold out to Konica in 1986 – a timely move to be sure, considering the late-1980s advent of film processing minilabs that reduced photo development time from a day to just an hour. Now that’s progress! The subsequent introduction of digital cameras and then, camera-equipped smartphones were the final nails in Fotomat’s coffin. 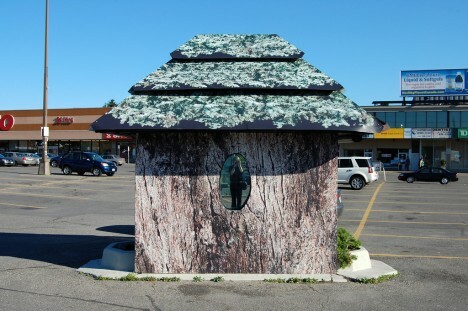 While some Fotomat booths were re-purposed into key-cutting kiosks, coffee drive-thru’s and so on, others were reborn in wholly unexpected ways. Flickr user Patrick Cummins (collations) brings us this odd ex-Fotomat located in a shopping center parking lot in northern Toronto, Canada. 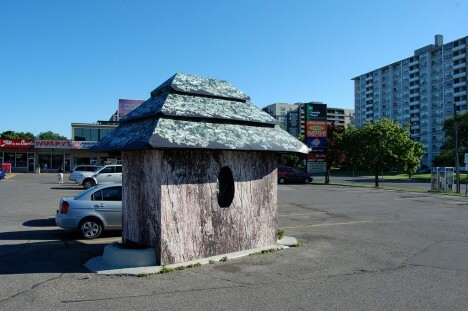 The kiosk appears to have been made over as some sort of naturist art project before being abandoned for good. 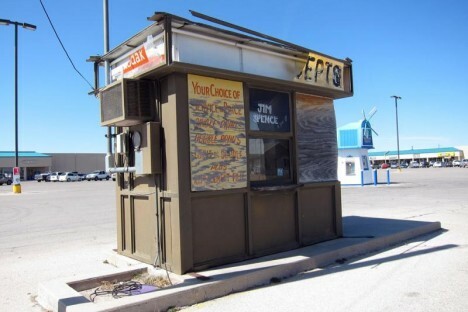 When you’re a Fotomac or Fotomate (as male and female staffers were cutely called) staffing a Fotomat kiosk in Lovington, New Mexico, your worst nightmare would be when the air conditioner conked out. At least one could compare miseries with whomever staffed that curious windmill booth in the near background. Flickr user Luis Capwell captured the poignant essence of this roofless abandoned Fotomat on March 5th of 2011. 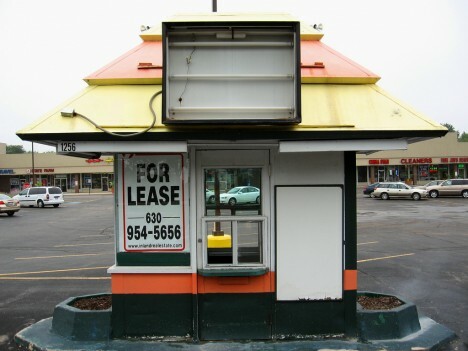 This faded & abandoned Fotomat kiosk in Dayton, Ohio lost its appeal long ago – even the OPEN/CLOSED sign has seen better days. 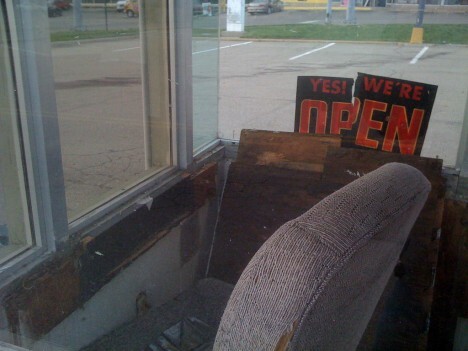 “Yes, We’re Open”? No, you’re not. A weathered coat of desultory grey/brown paint grudgingly reveals the booth’s original sky-blue walls through cracks encouraged by numerous bitter Ohio winters. 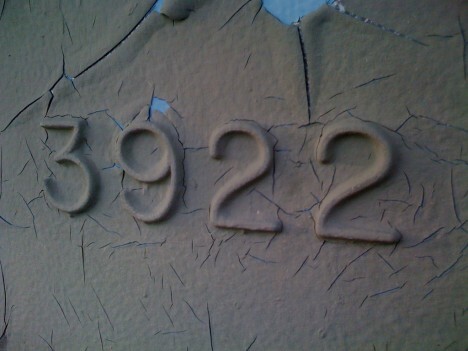 Even the concrete is peeling. 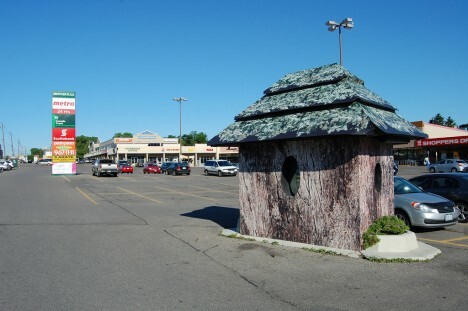 Flickr user Rob Anspach (Circa71) visited the decrepit former Fotomat at the Linden Shopping Center in April of 2009, if only to take photos – not leave them. 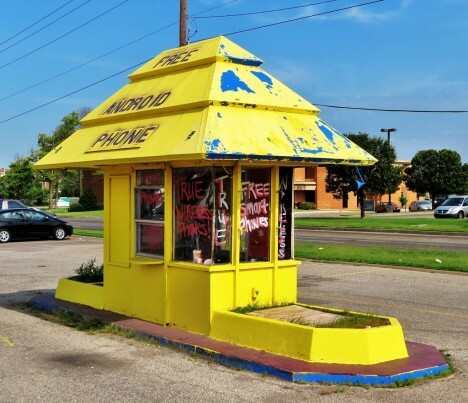 “The cute little hut with the big yellow roof”… now there’s a Kodak moment for ya! 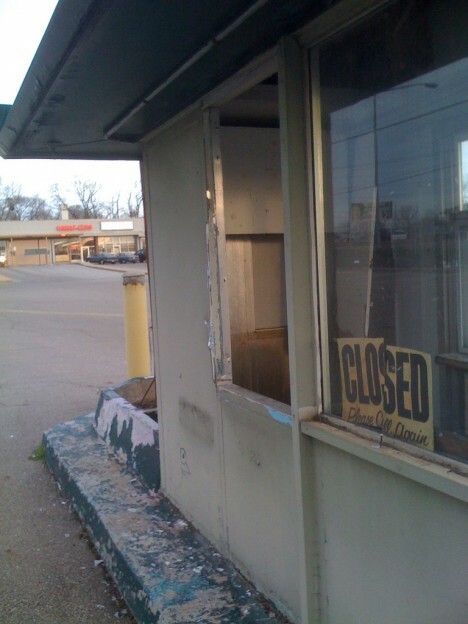 On August 21st of 2007, Flickr user Joe Balynas (muledriver) photo-documented the above ex-Fotomat (most recently, a drive-thru coffee shack) looking for a further reincarnation. The jumbo add-on fluorescent sign should help.